This is a Pleated Cartridge Filter for a fluid bed dryer unit. Some pharma manufacturers have had problems with product release and clogging in these types of filters. This results in down-time for cleaning and replacement, as well as lower product yield per batch. This is the same unit, fitted with one of our exclusive custom designed sleeves. 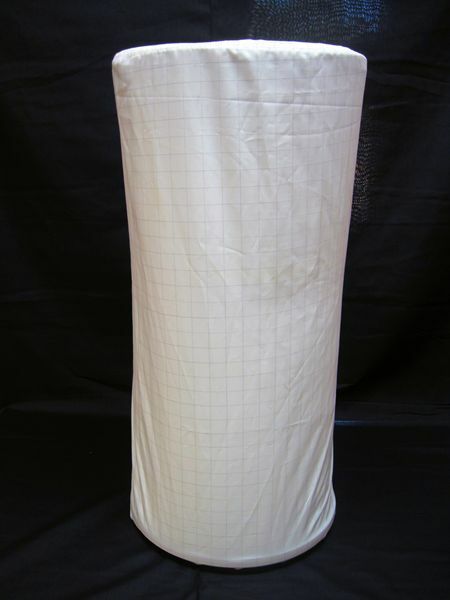 Our sleeves are manufactured from a synthetic CONDUCTIVE (Anti-Static) AND NON-CONDUCTIVE filter cloth with a CFM of between 40-60, which safely dissipates static electricity. The proper fit of the sleeve is essential to allow for necessary air-flow to ensure drying and release of the product. Kavon’s experienced technicians know how to produce these sleeves with the required precision. The end result is a cleaner operation with maximum product yield.